This is one of the post I had delay from day to day, week to week, month to month. 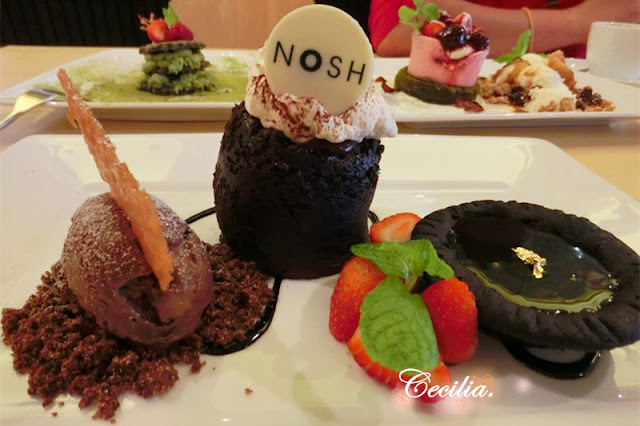 We had visit NOSH to trying their limited seasons dessert. I'm so sorry that I had not updating on time. However, you still can visit to take their latest season dessert which is winter and will end by this month on 31st December 2013. 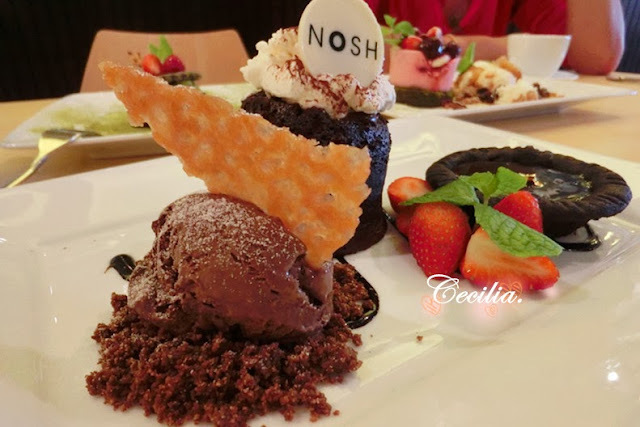 I've been the fan of the NOSH since my first visit when took their brunch. Rm29 for 2 selection or Rm41 for 3 selection. I love its beautiful display which is really full of attraction to a girl especially me! 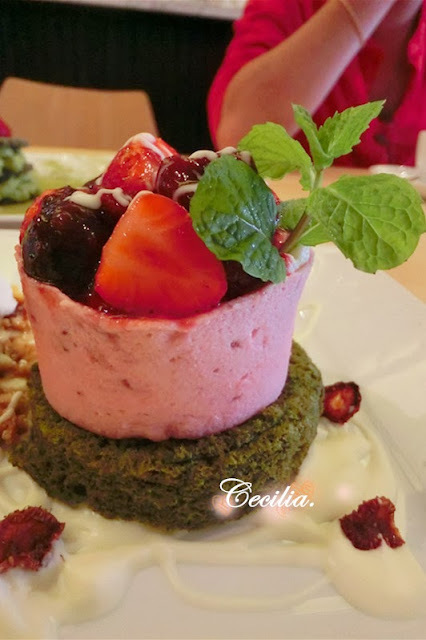 The portion of the custard cream is rich while balanced with the piquant flavor of the berries, whereby the base cover with green tea cake to deviation the overall sweetness of the dessert. 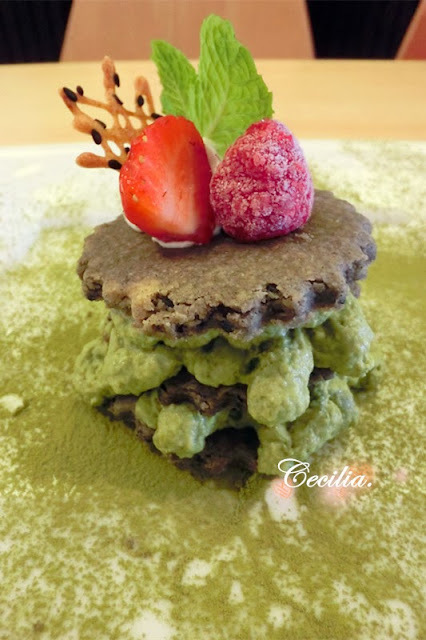 The combination of green tea mousse and red bean cover by the black sesame wafers and strawberry bite to adorn looks like a Japanese dessert! This is too pretty when eat. However, the taste have a bit weird for me maybe cause by wafers? One of my favourites dessert because I like crunchy texture. 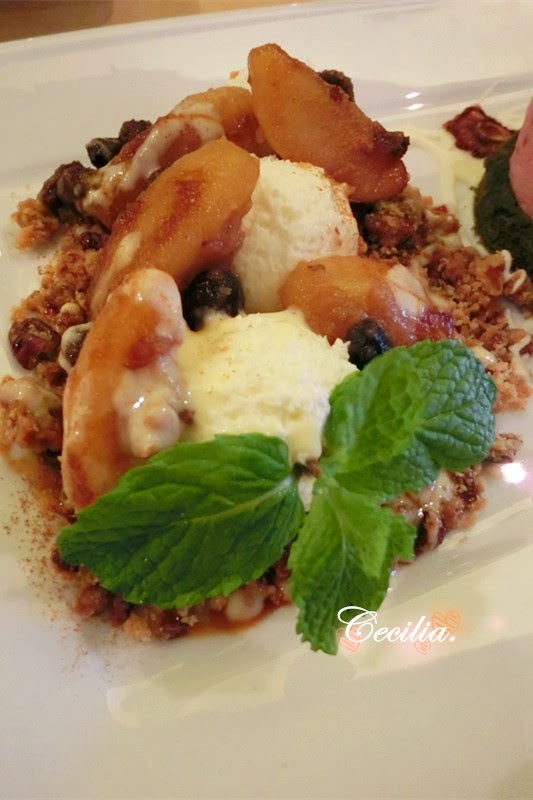 This dessert served by cinnamon apple slices, cheese mousse and nutty crumble. The design of apple cheese tart is random without fine to plot and not have "tart" come with actually. 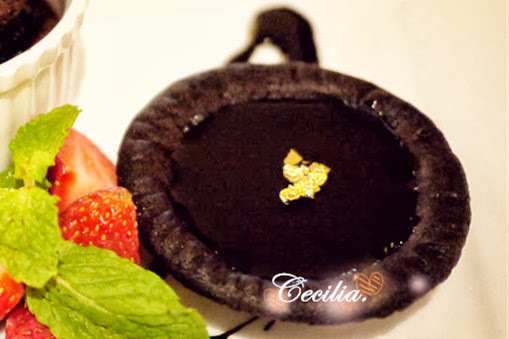 How it was amazing dessert to patrons. 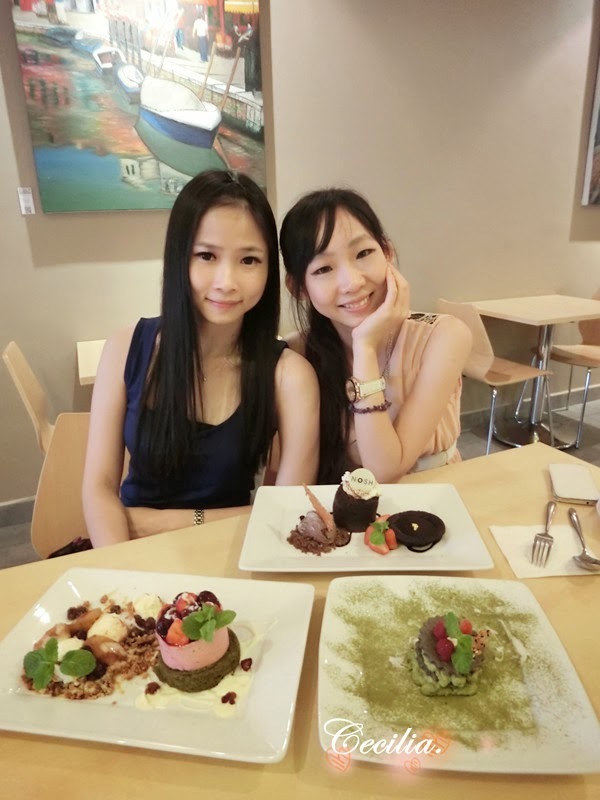 We are planning to fill our stomach with dessert only as our dinner! This is what girls dream! 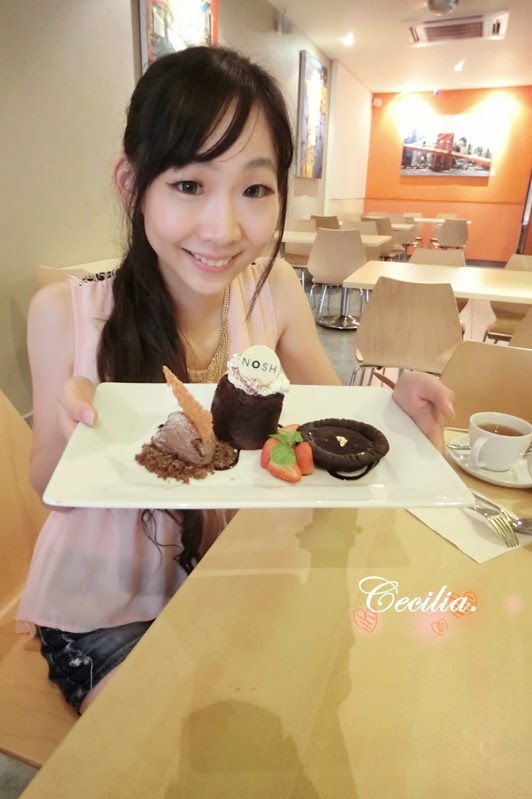 So we order their signature dessert that will bring us to dessert heaven. This is totally a chocoholics drea. Living up with it's name with descripition a molten chocolate cake, tart au chocolat and gourmet chocolate ice cream was to die for. I love this most because the same reason--crunchy biscotti as base. Actually we are order Peanut Butter Heaven instead apple cheese tart, but we are not realize the difference because the menu only showing words, no any picture for each dessert.But it tasty too. Don't curious, their dessert always not make you disappoints. I would like to order Just Tiramisu, Full Monty... is worth to dreaming about.